PROJECT: Lower Rear Grills. I elected this particular configuration (seen on a race car) for it's simplicity. 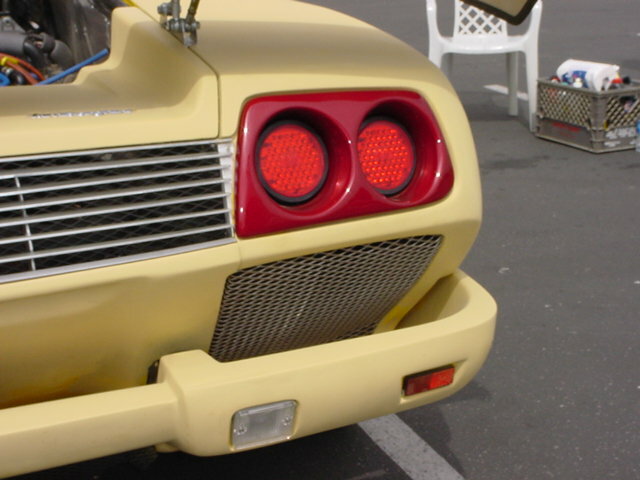 To make the outer grills, first a cardboard pattern was cut to the shape of the opening. Next, the pattern was traced onto expanded sheet metal with a felt tipped marker. 1/2 inch allowance was made all around the pattern to allow for a "lip" to be bent all around the part. The expanded sheet was cut by hand using a tin snips then bent into shape using a medium sized vice grips and a small bench vise. Each grill was made to precisely fit it's opening and took about three hours to fabricate and mount. Labor: Six hours. Parts: expanded sheet metal, mounting hardware. Estimated Cost: $15.00 a day.